This beautiful Ultramarine Doric and Pansy Butter and Cover was made by Jeannette Glass from 1937 to 1938. It is in excellent condition with no chips or cracks. This is a hard butter dish to find. We guarantee all items to be as described. Please feel free to email any questions. THANK YOU. This really pretty pink, vintage, Cherry Blossom depression glass 14 Piece Childs Dinner Set was made by Jeannette Glass from 1930 to 1939. The set includes four 6 inch Plates, four 3 inch diameter Cups, four 4 1/2 Inch diameter Saucers, one 2 1/2 inch high Sugar Bowl and one 2 1/2 inch high Creamer. All 14 pieces are in very good condition with no chips or cracks. We guarantee items to be as described. THANK YOU. 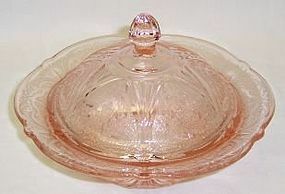 This is a really pretty pink Royal Lace depression glass Butter Dish with Cover made by Hazel Atlas from 1934 to 1941. Both the Butter Bottom and Cover are in very good condition with no chips or cracks other than one pin-point nick on the bottom inner rim that you can just catch your fingernail on. Be sure to search our other Royal Lace available. We guarantee all items to be as described. Feel free to email with any questions. THANK YOU. 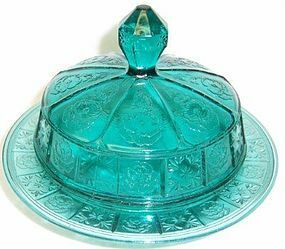 This really pretty Monax American Sweetheart depression glass Single one Shaker was made by MacBeth-Evans from 1930 to 1936. This Shaker measures 4 inches high to top of lid. It is in very good condition with no chips or cracks. The lid is good and usable, but does have three minor dents in it. See picture for more detail. Be sure to search our other American Sweetheart available. We guarantee all items to be as described. Feel free to email with any questions. THANK YOU. 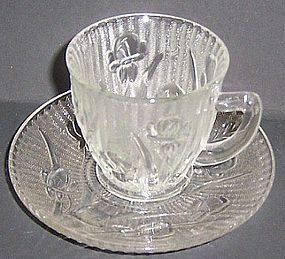 This pretty crystal Vintage Iris and Herringbone depression glass Demitasse Cup and Saucer Set was made by Jeannette Glass from 1928 to 1932. This Demitasse Saucer measures 2 3/8 inches in diameter at the top. The Saucer measures 4 1/2 inches in diameter. Both the Cup and Saucer are in very good condition with no chips or cracks. Be sure to search our other Iris available. We guarantee all items to be as described. Feel free to email with any questions. THANK YOU. 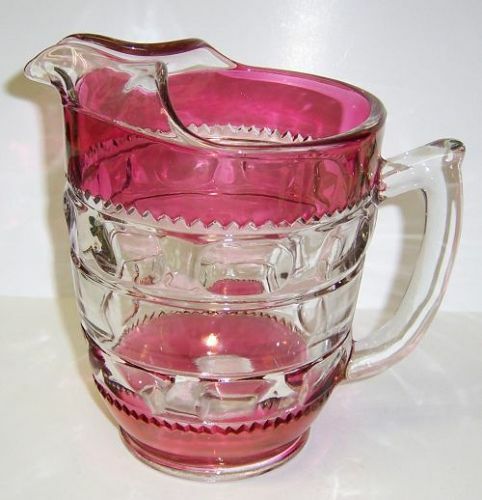 This really pretty Ruby Flashed Kings Crown 7 1/2 inch high Flat Water Pitcher with Ice Lip was made by Indiana Glass. 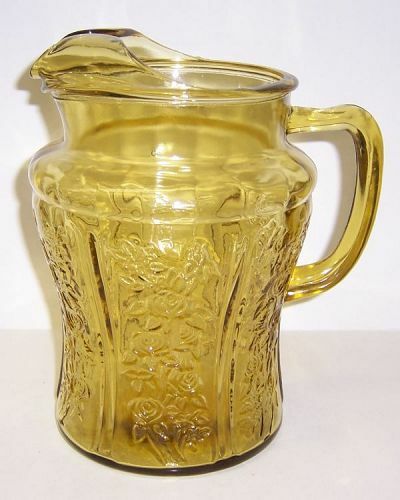 This Pitcher measures 5 1/2 inches in diameter across the top. It holds 54 ounces. It is in very good condition with no chips, cracks or scratches. The ruby flashing is all very good. Be sure to search our other Indiana glass available. We guarantee items to be as described. THANK YOU. 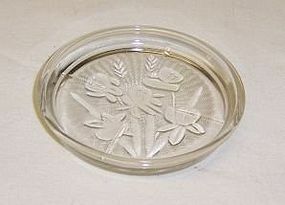 This really pretty Florentine Number 2 Poppy Number 2 depression glass round Butter Dish with Lid was made by Hazel Atlas from 1932 to 1934. The base of the butter dish measures 6 1/2 inches in diameter. Both the Butter bottom and lid are in very good condition with no chips or cracks. Be sure to search our other Florentine available. We guarantee items to be as described. THANK YOU. This really great green Tulip depression glass Water Tumbler was made by the Dell Glass Company in the 1930s. 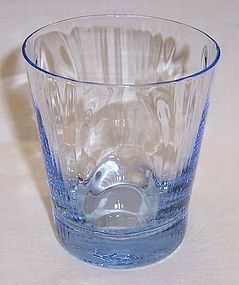 This is a rare, unlisted tumbler. This Tumbler measures 4 5/8 inches high X 3 3/8 inches in diameter at the top. It is in very good condition with no chips or cracks. There is a 1/32 inch pin-point mark on the outer top edge of the tumbler. Be sure to search our other Tulip available. We guarantee all items to be as described. Feel free to email with any questions. THANK YOU. 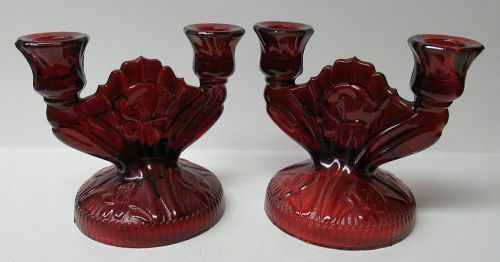 This really pretty pair of pink Royal Lace depression glass Ruffled Edge Candle Holders were made by Hazel Atlas from 1934 to 1941. 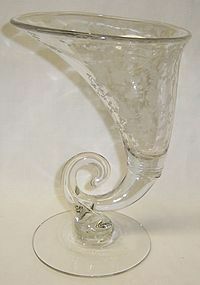 The Candle Holders each measure 5 Inches in diameter X 2 1/4 inches high. They are both in very good condition with no chips, cracks or scratches. Be sure to search our other Royal Lace available. We guarantee items to be as described. THANK YOU. 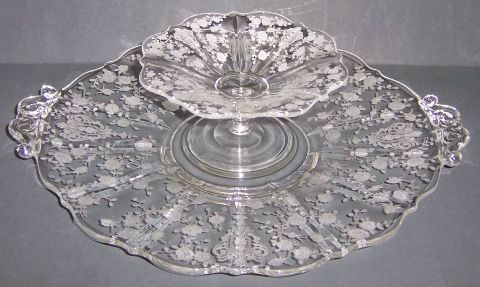 This hard to find, vintage, crystal Iris and Herringbone depression glass 3 1/4 inch diameter Coaster was made by Jeannette Glass from 1928 to 1932. This Coaster measures 1/4 inch in depth on the inside. It is in very good condition with no chips or cracks. Be sure to search our other Iris available. We guarantee all items to be as described. Feel free to email any questions. THANK YOU. 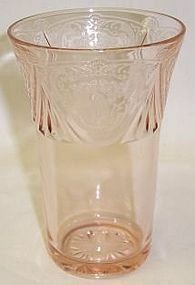 This really pretty pink Royal Lace depression glass 5 inch 12 Ounce Ice Tea Tumbler was made by Hazel Atlas from 1934 to 1941. The Tumbler measures 3 1/4 inches in diameter at the top and is in very good condition with no chips or cracks. Be sure to search our other Royal Lace available. We guarantee all items to be as described. Feel free to email any questions. THANK YOU. 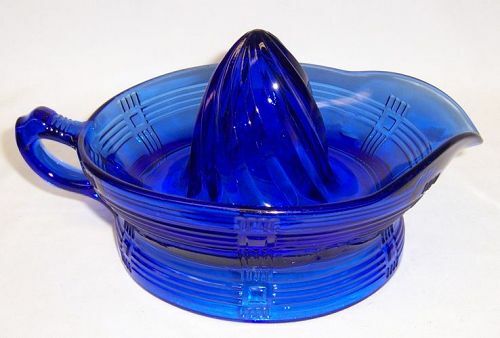 This really pretty, vintage, Cobalt Blue Criss Cross Crisscross kitchen glass Orange Reamer was made by Hazel Atlas. This Reamer measures 8 1/2 inches long X 5 3/4 inches wide. It is in really good condition with no chips, cracks or scratches. Be sure to search our other Criss Cross available. We guarantee items to be as described. THANK YOU. This is a really great pair of depression glass green Madrid Footed Salt and Pepper Shakers made by Federal Glass from 1932 to 1939. The shakers measure 4 inches high to top of lid. Both shakers are in very good condition with no chips or cracks. The original lids are good. Be sure to search our other vintage Madrid available for sale. We guarantee items to be as described. THANK YOU.